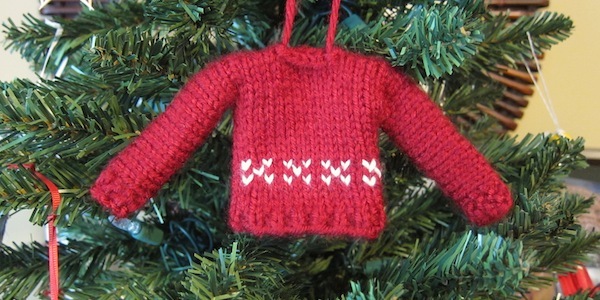 We’ve knit tiny toques and mini mittens for our advent calendar, now let’s add a tiny sweater. This little sweater knits up quickly in one piece. The fun thing is you can personalize the sweaters anyway you want. For the example above, I did a simple colorwork pattern. A couple years ago, I did one for everyone in my family and duplicate stitched their initials on them. They looked so cute on all the gifts. Gauge is not really important for this project, but I have given you what I used to make this ” sweater. Try it with sock yarn and smaller needles for a really tiny sweater. Row 3-17: Work in stockinette starting with a purl row. Row 19: Cast on 16 stitches, purl until last 3 stitches, k2, p1. You will have a piece that looks like this. 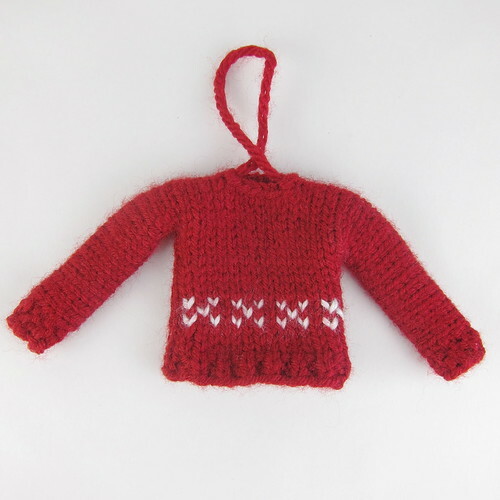 6 years ago by Kat in Advent Calendar Project , Christmas , Holiday , Knitting , Knitting Projects , Needlecraft , Projects | You can follow any responses to this entry through the RSS feed. You can leave a response, or trackback from your own site. This looks so warm. Perfect for the Christmas tree! Pati – Oh my gosh, you are right. I had the numbering wrong & row 33 – 36 should have read 33 – 46 and then the rest should have been 47, 48 & 49. I fixed it below and in the pdf. I didn’t give instructions for the colorwork as that is just a suggestion on a way you can decorate it. All I did was did a white fair isle “x” you could also do something in duplicate stitch. I only did the decoration on the front. This is an adorable pattern! 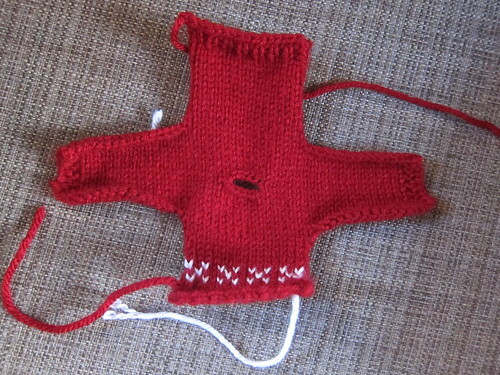 I’m about halfway through a Christmassy red one – can’t wait to put it up on the tree. Going to make some in my favorite pink shimmery yarn as well. One small correction: I think the second row should be k1, p1 until the end of the row? Yes, you are right. Man, I don’t know where my head was when I was writing this pattern. I did the same thing on row one & fixed it but didn’t there. Do you have instructions for crocheting these ornaments? I don’t knit but I love these little sweaters, hats and mittens! If I can get crochet directions, I’ll be able to make them for next year, since I didn’t find your web site until a few weeks ago. Thanks for great ideas! Jennifer – Sorry, I am a beginning crocheter and haven’t gotten past granny squares, so I’ve only written these patterns for knitting. I bet if you look on Ravelry you might find something for crochet through. 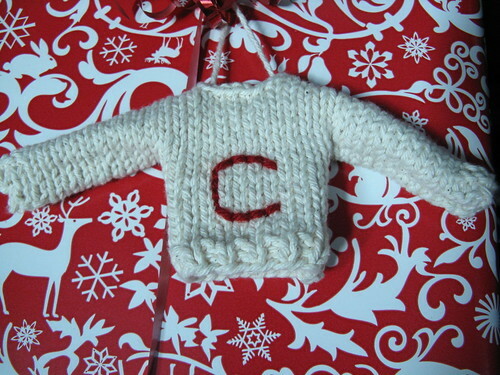 here is a link to a crochet site that features miniature crocheted sweaters. I hope you will enjoy them. i love this pattern, I’m making one each for nieces and nephews! I’m a bit confused though, at row 17 I’m on the wring side of the work. so should i be purling rather than knitting these stitches? although this throws off the rest if the pattern too. Or is the ws/rs at the beginning of the pattern off? Oh my gosh, seriously this pattern will be the death of me. Row 17 should be part of the stockinette section. I think I have fixed the numbering so everything is right now. The download is corrected too. thank you, its a really great pattern though! Thanks for posting this pattern. I’m new at knitting and have been making these little sweaters as Christmas gifts. Keep up the good work! So, I’m a bit confused its this pattern. For row 19, I cast on 16 and follow the instructions, but 1. I’m purling the wrong side and 2. The main block established on rows 1-18 doesn’t weave properly. It leaves a gaping hole. What am I doing wrong? Is there an updated pattern I should be using? Laurie, I’ve sent you an email which hopefully will help with your questions. I can not get the neck to work out the problem row 24 says to bind off the stitches not sure why row 25 says to cast off aren’t they the same.I end up with a big hole below the neck as well as the neck opening please help ! Row 25 says to cast on 5 stitches, not cast off. So in row 24 you bind them off and on row 25 you cast them back on. It just makes a 5 stitch neck hole. Hi Kat, I belong to a knitting group who knit for charity. Would it be okay to share this pattern so we can make some to give in gift bags for the elderly?